We are always adding to our herd as we look for elephants in desperate need of care. The next rescue can be days or months away. We have to purchase the elephants from their owners whom often demand big prices for their elephants freedom. There are lots of elephants at the park and you can learn about them on the website. The story that touched my heart was Kham Puam’s one. Her name means “Golden Bell”. She spent most of her life working on the Thailand-Burma border in an illegal logging busniess. At some point her eyes were damaged either through an accident at work or to do with abuse. She was left 90% blind. Her eye problems affected her work performance so she was moved to a trekking camp. Thankfully, tourists expressed concern to the owner about her milky eyes and how she was feeling her way along the paths.So she was released at a price. 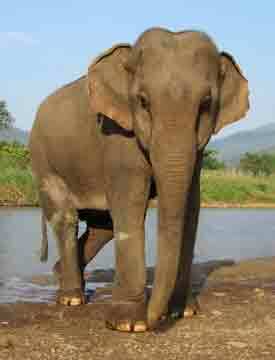 On December 8th 2010 she came to Elephant Nature Park where she has secured the quality of life that she so deserves. The sanctuary was opened by Lek Chailert, the Elephant Whisperer after she saw how poorly the elephants were being treated in Thailand. She had an elephant as a young child and this inspired her to found a sanctuary for sick and needy elephants that were working in bad conditions. Elaine Ross visited the park and was also inspired to do something to raise funds so that more elephants could be rescued and go to this wonderful place. Elaine has set up her own Facebook page for this cause. We really want this song to win. It would help more elephants to spend the rest of their life in peace and safety. One way that you can help elephants is by not supporting elephant poachers by buying ivory or skin products whether allegedly legally obtained or not .It’s the usual simple economics. Demand = more death to these innocent creatures. The other thing that you can do is to vote for the song. The great thing is that you can vote every 24 hours, so do it as often as you can. Daily would be ideal but if it is not possible, just do it when you can. Involve your friends too. Make a few trunk calls and tell them about it. You will be helping elephants like Kham Puam to be rescued from a life of abuse and neglect. Please help Elaine to win this money for the Elephant park. Somewhere out there at this very moment, an elephant is in dire need of help. This entry was posted in Animal Work, Environment and tagged Elephant Nature Park, Elephants, International March For Elephants London, The Red X Project. Bookmark the permalink.